Custom launch specialist Cockwells has revealed that it has delivered a pair of seven metre tenders to the 70m Perini Navi sailing superyacht Sybaris. These two bespoke tenders share the same hull and were designed in-house by the Cockwells team to fit the existing storage areas on board the Philippe Briand-designed ketch. The Cockwells seven metre sports tender features a completely open layout for entertaining guests, with two aft sunpads and seating space for eight surrounding the central helm station. 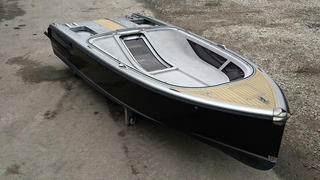 Meanwhile, Sybaris’ limousine tender has been fitted with a roof that can be removed and stored upside down in the cockpit well – a practical touch that means that it can fit in Sybaris’ foredeck tender garage. 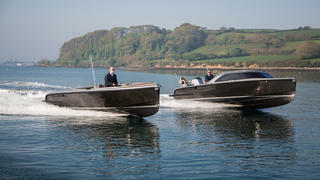 The removable roof also allows the limousine tender to double up as a second sports tender when needed. Built from carbon fibre composite, the two tenders were designed to weigh less than 2.2 tonnes, including fuel and driver, and cruise at more than 35 knots, with power coming from 260hp Yanmar 6BY3 engines. In order to satisfy the owner’s request for the highest possible quality, Cockwells finished many of the fixtures and fittings in titanium. Other upcoming projects at the Mylor Creek yard include an eight-metre convertible limousine tender and a hybrid electric superyacht tender.